David is the T.M. Stout Chair of Stratigraphy and a Professor of Geosciences at the University of Nebraska-Lincoln. He is an expert in dating rocks with microfossils, especially diatoms (marine algae). He has visited Antarctica fifteen times since his first trip south in 1983. His research experience ranges from small, remote geological tent-camps in the Transantarctic Mountains, to marine geological cruises on research icebreakers on the Antarctic continental shelf. 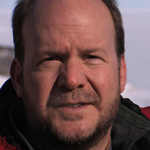 Most recently he has served as Principal Investigator of the ANDRILL (ANtarctic geological DRILLing) Program, and co-chief scientist for the Southern McMurdo Sound drillhole. Chief goals of this multinational effort are to recover sedimentary rock core from the continental margin to interpret Antarctica's Cenozoic climatic and tectonic history.